Prof. Dora C. Lau is an Associate Professor in Department of Management at The Chinese University of Hong Kong (CUHK) Business School. She is also the coordinator of the PhD Programme in Department of Management and the Associate Director of Center for Entrepreneurship. 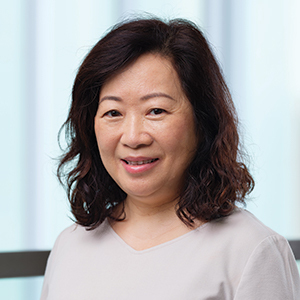 Prof. Lau’s research interests include demographic diversity and faultlines, team compositional dynamics, relational trust effects including interpersonal trust and feeling trusted, upper echelon composition and organisational impact, family business challenges and management, and Chinese management. Prof. Lau has published extensively in top-tiered journals such as Academy of Management Review, Academy of Management Journal, and Journal of Applied Psychology. She is currently serving as the Consulting Editor of the Journal of Applied Psychology, the Associate Editor of the Journal of Trust Research, and also guest-edited a Special issue for the Asia Pacific Journal of Management, namely Leadership in Asia. Prof. Lau received her PhD degree from The University of British Columbia. L. Lam, C. S. Wong, Z. Peng, and Dora Chi-sun Lau (2017), “Is more feedback-seeking always better? Leader-member exchange moderates the relationship between feedback-seeking behaviour and performance,” Journal of Management, 43(7), 2195-2217. W. Li and Dora Chi-sun Lau (2014), “Asymmetric factional groups in family firms: When group faultline is a good thing,” Academy of Management Best Paper Conference Proceedings, 1412-1417. Dora Chi-sun Lau and S. Wei (2014), “Examining the Effects of Feeling Trusted by Supervisors in the Workplace: A Self-Evaluative Perspective,” Journal of Organisational Behaviour, 35, 112-127. Sanchez-Manzanares R. Rico, Antino M. M., and Dora Chi-sun Lau (2012), “Bridging Team Faultlines by Combining Task Role Assignment and Goal Structure Strategies,” Journal of Applied Psychology, 97(2), 407-420. S. Wen, Dora Chi-sun Lau, and L. Lam (2012), “Enhancing Trust in Chinese Organisations.” In The Handbook of Chinese Organisational Behaviour: Integrating Theory, Research, and Practice, Cheltenham, Glos, UK: Edward Elgar Publishing, 289-306. L. Lam and Dora Chi-sun Lau (2012), “Feeling Lonely at Work: Investigating the Consequences of Unsatisfactory Workplace Relationship,” International Journal of Human Resource Management. L. Lam, X. Huang, and Dora Chi-sun Lau (2012), “Leadership Research in Asia: Taking the Road Less Traveled?” Asia Pacific Journal of Management, 29, 195-204. Dora Chi-sun Lau and J. K. Murnighan (2010), “Fautlines,” Encyclopedia of Group Processes and Intergroup Relations, 278-281. Dora Chi-sun Lau and R. Liden (2008), “Antecedents of co-worker trust: Leaders’ blessings,” Journal of Applied Psychology, 93(5), 1130-1138. Dora Chi-sun Lau and L. Lam (2008), “Effects of trusting and being trusted on team citizenship behaviours in chain stores,” Asian Journal of Social Psychology, 11, 141-149. Dora Chi-sun Lau, S. Salamon, and L. Lam (2008), “The impact of relational demography on perceived managerial trustworthiness: Similarity or norms?” Journal of Social Psychology, 148(2), 187-208. L. Lam and Dora Chi-sun Lau (2008), “Work climate and customer satisfaction: The role of trust in retail context,” Journal of Management & Organisation, 14(2), 141-154. Dora Chi-sun Lau, J. Liu, and Pingping Fu (2007), “Feeling Trusted by Business Leaders in China: Antecedents and the Mediating Role of Value Congruence,” Asia Pacific Journal of Management, 24, 321-340. Dora Chi-sun Lau and J. K. Murnighan (2005), “Interactions within groups and subgroups: The dynamic effects of demographic faultlines,” Academy of Management Journal, 48(4), 645-659. S. Havlovic, Dora Chi-sun Lau, and L. Pinfield (2002), “Repercussions of work schedule congruence among full-time, part-time and contingent nurses,” Health Care Management Review, 27(4), 30-41. B. Bemmels and Dora Chi-sun Lau (2001), “Local union leaders’ satisfaction with grievance procedures,” Journal of Labour Research, 24(3), 653-667. Dora Chi-sun Lau and J. K. Murnighan (1998), “Demographic diversity and faultlines: The compositional dynamics of organisational groups,” Academy of Management Review, 23(2), 325-340.